So, I had a bit of an OCD moment yesterday and I thought I would share it with you guys. 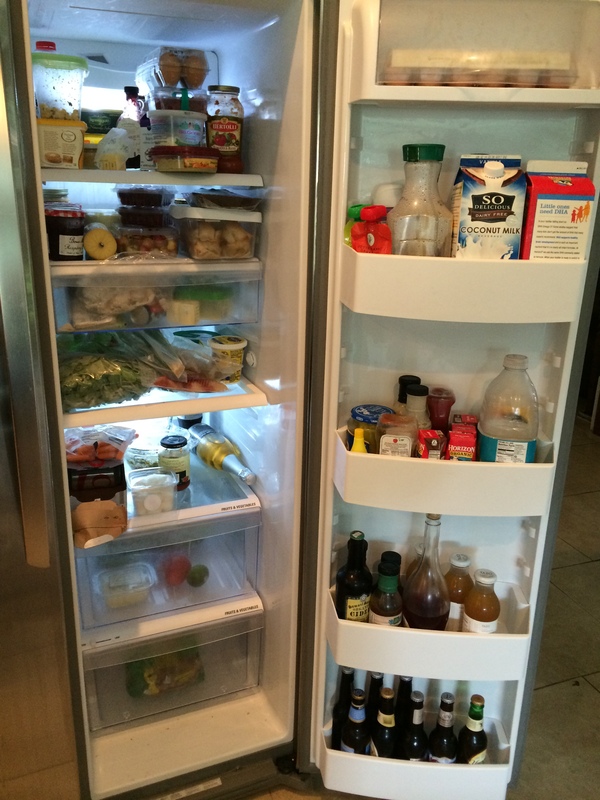 Our fridge…it is amazing to me. 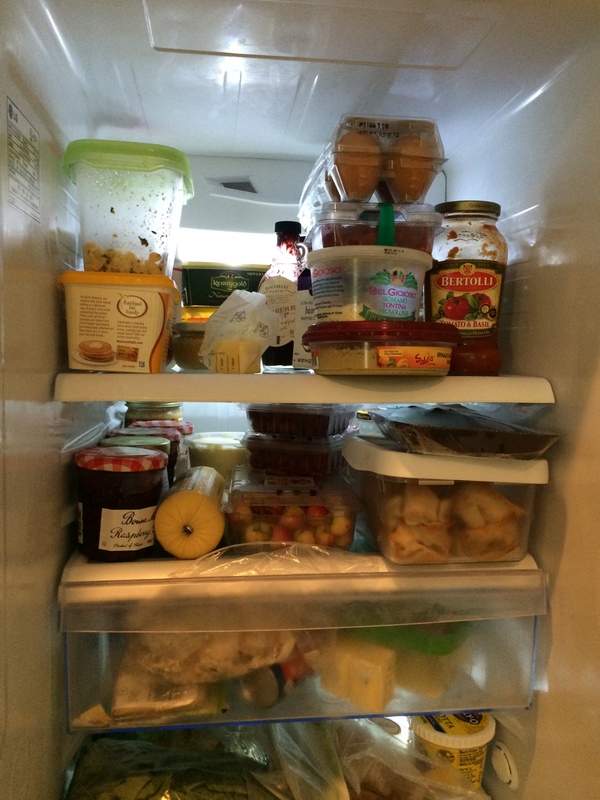 There are only two of us, but it always looks like a food bomb has gone off in our ice box. I can’t imagine what it would be like with kids constantly opening the door and riffling around in there. Here it is in all its scary-ness… The first thing you’ll want to do is declutter and get rid of all the expired stuff in there. I think it goes without saying that you’ll want to do this quickly, so things don’t sit out at room temperature for too long. As you can see in these ‘before’ pictures, things were basically all over the place with no home. There were actually eggs in the door AND in the main part, all varieties of cheese (I love cheese) all over the place, leftovers just strewn about, and veggies and fruit everywhere. The funny thing is that the drawers at the bottom weren’t really being used at all. It is no wonder we were throwing out expired food all the time. I had no idea what was in there! This part is a little sad for me, I hate throwing out food. 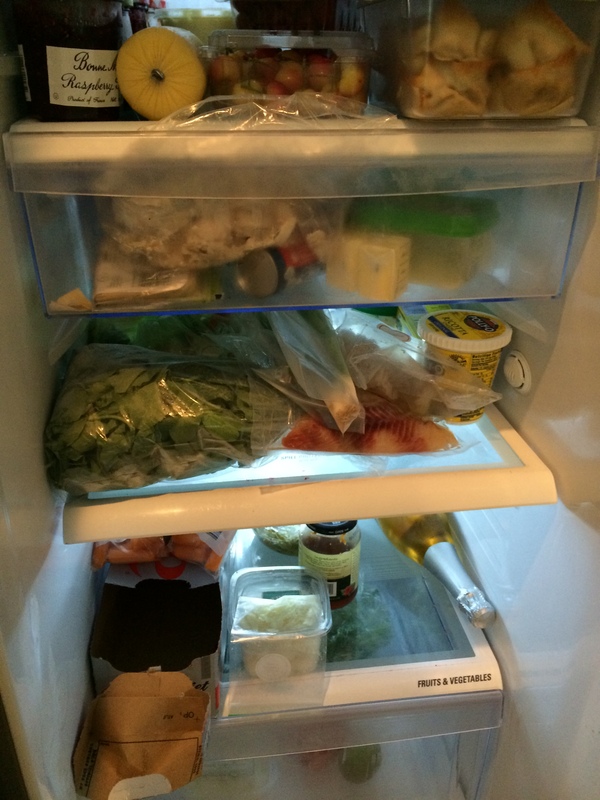 It is so wasteful and yet we do it all the time because I have no idea what is actually in the refrigerator. I pulled everything out of the fridge and separated it by category on the counter. I then measured the shelves and made a quick trip to Bed Bath and Beyond to get these super fancy containers. I even got one for the eggs, which I always thought was pointless, until I realized I can now stack things on that container too. Brilliant. I also went by Target and picked up some labels for each of the bins and got a dry erase board that we’ll talk about later. TIP: This is a fantastic time to deep clean and get all the gross out. I’ve read that keeping activated carbon in your refrigerator will help if you have issues with smelly odors. Also, if you hate cleaning, put cling wrap down on all the shelves for easy clean up later. Wiping up spills when they happen will also save you a lot of heartache in the end. You know your family and food needs best, so you’ll have to make the category choices for yourself. 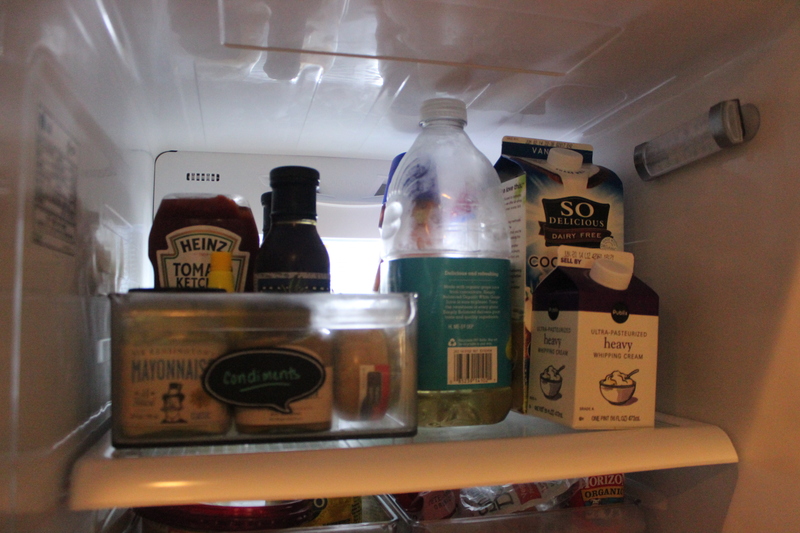 On the top shelf I went with Condiments and Milks/Juices. TIP: Apparently, milk shouldn’t be kept in the door because the temperature fluctuates too much. This is also true about eggs. They should both be on the inside of the fridge. The next level consisted of another Condiments bin and a Snacks bin. The cool thing about these bins is that you can take them out and put them back in, all in one little neat package. TIP: Make sandwiches a lot? Make a bin for sandwiches and keep all the sandwich fixin’s in it. That way you can grab it out of the fridge, make those sandwiches and then just return it. Next is a drawer that is now dedicated to cheese. Yup. Cheese. I think there might be a roll of croissant rolls in there too. But mostly cheese. 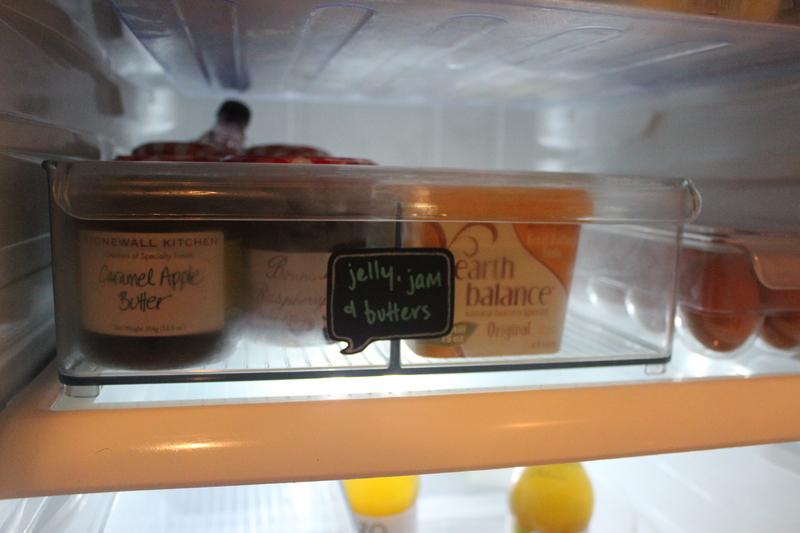 We have an obscene amount of jelly, jams and butters. Obscene. So the next level has a bin dedicated just to those. The eggs are also on this level, now inside the fridge and not in the door. Next are the sodas, teas, and leftovers. There are two levels of soda holders, but it is hard to see that in this picture, since I need to go and buy some more. The teas in the back are sitting on a lazy susan (where did that name even come from? ), so we can turn it around and find what we want. I also left some room for leftovers on this shelf. 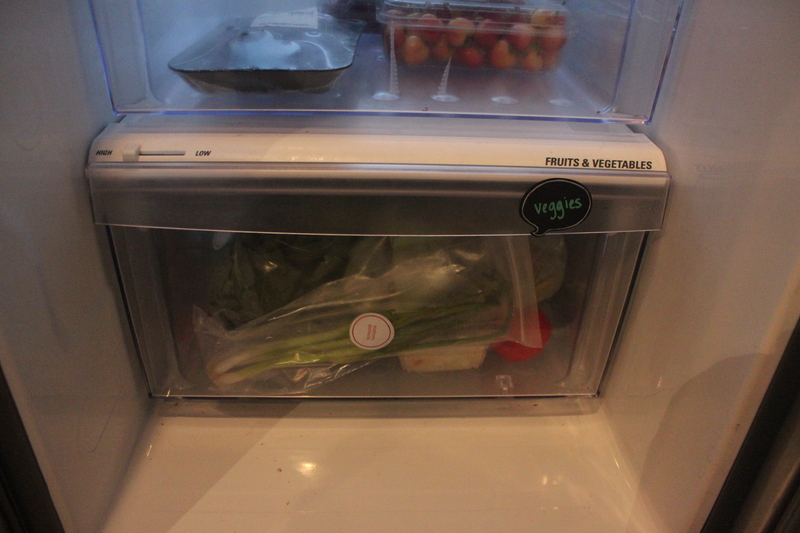 TIP: If you have raw meat in your refrigerator, this is where it should to go. You always want raw meats and seafood to be on the bottom shelf to avoid contamination. Now the drawers are actually being used – the top for fruit and the bottom for vegetables. TIP: The vegetable drawer should be humid. News to me. 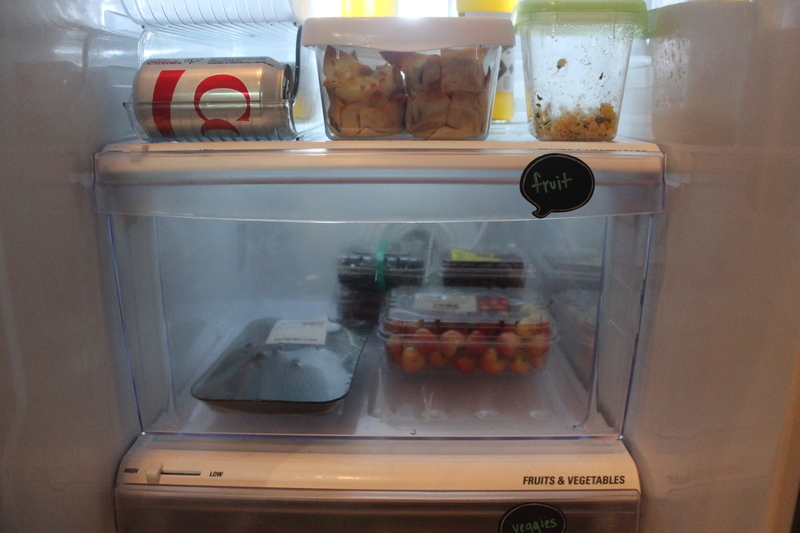 Also, I found a really helpful article about keeping your fruits and veggies fresh for longer. So, you’ve moved all your milk and eggs out of the door…what goes there now? Well, I added another Snacks shelf and a Misc. shelf for all that random stuff that shows up from time to time. It is currently holding a pitcher of lemon-infused water. Yum. The last two shelves house Wine and Beer because they need their own space too. Remember all that butter I was mentioning? Well I have a separate place for the butter I use specifically for baking. It now lives in what was once the egg holder in the door. Genius, I know. 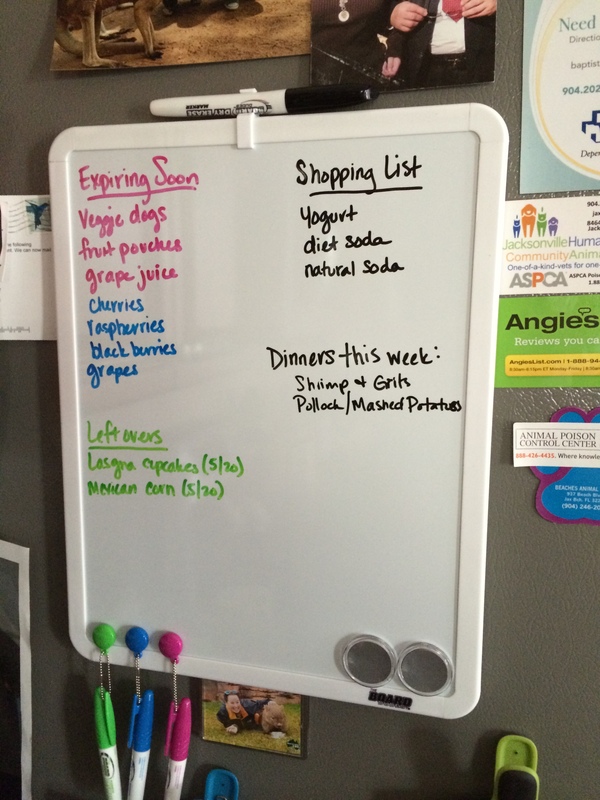 Now, for all of you fellow OCDers out there, I present to you (dramatic pause) the dry erase board. Whether or not this will stay updated at our house is questionable, but it is a great idea in theory. 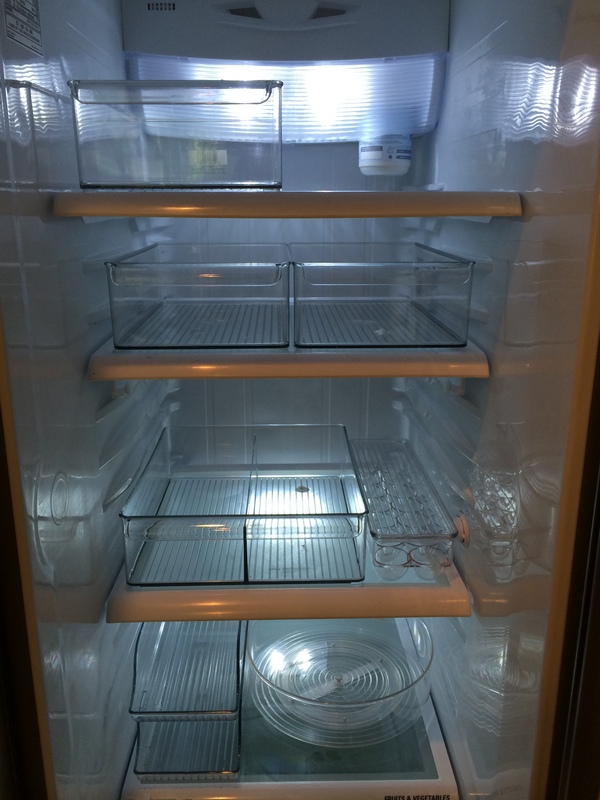 This way I can keep track of what’s in the fridge, what’s going to expire soon, what leftovers we need to consume, and what I desperately need to purchase on my next trip to the grocer. 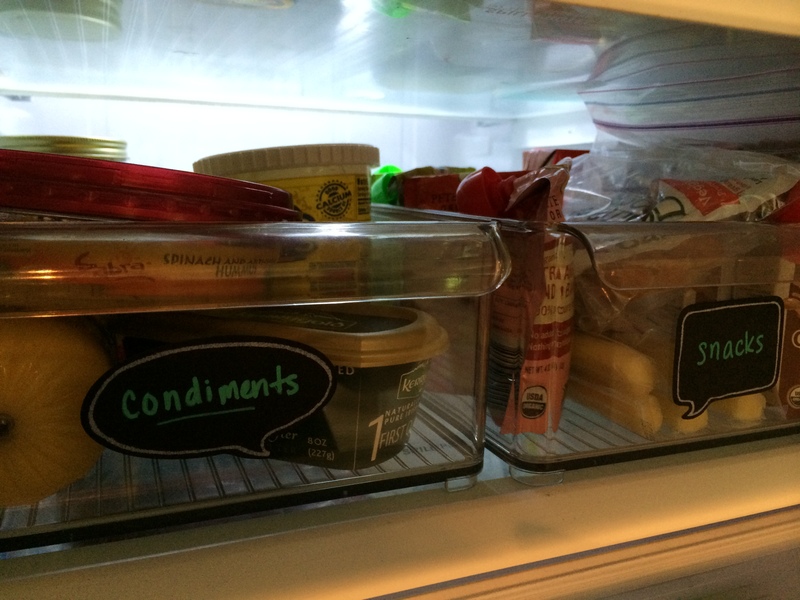 I’m also going to try and plan weekly meals ahead of time… try. 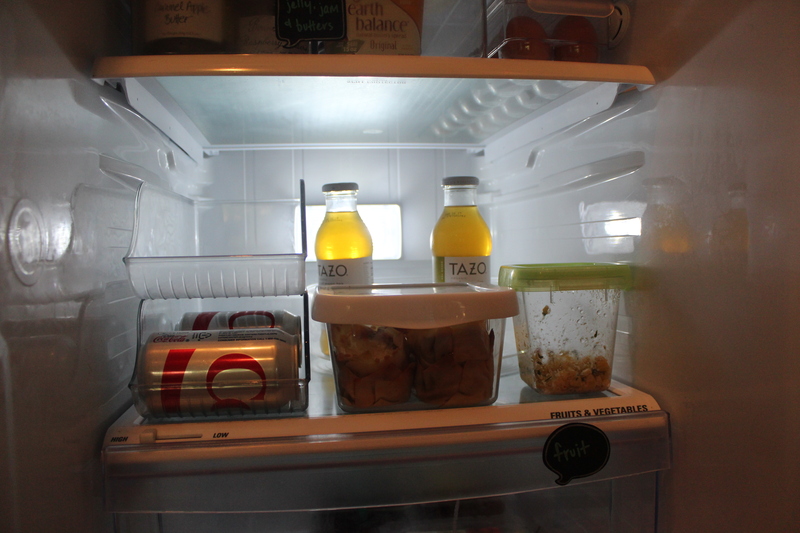 So there you have it, a nice organized fridge in only a few hours. Definitely an afternoon well spent!